Polenta seems to puzzle a lot of people. I serve it a lot and a few friends have mentioned that they have never heard of it or known what to do with it. Essentially it's a vehicle for a dish, no different to rice or pasta, and the more you put in, the more you get out. Served "wet", it's particularly good with slow cooked meat sauces like my mum's one here or something like an oxtail and wine stew. You can slice and grill it too, which is better if you are serving it as a side to a dish. And I just love it in cakes. A store cupboard hero for sure. This is a speedy mid-week way of serving polenta, when hours cooking down a thick sauce is not possible. 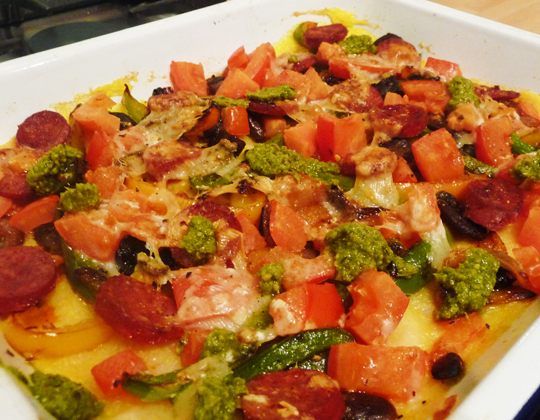 I like to call it fully loaded polenta and you can adapt it to suit what you have in the fridge - a fantastic end of week clear out recipe! Make the polenta as per the packet instructions. Generally it should be to add 200g it to 900ml of boiling salted water, stirring continuously for 7 minutes. Roughly before the last minute of cooking, add the drained beans and stir through. Pour into an oven proof dish greased with a little olive oil and even out. You want it a few centimeters thick. Fry the sliced onion, green pepper and mushrooms in olive oil until they are soft and beginning to brown, season with salt. Pour over the polenta, oil and all. Arrange the chopped tomatoes and sliced chorizo or sausage over the polenta as well. Finally, shave over plenty of parmesan. Place under a hot grill until the tomatoes have softened and the chorizo is sizzling. Remove from the grill and dot over a few spoonfuls of pesto.